I've never done anything like this before, but I've decided to try my hand at hilting up a blade. I bought an Albion Second blade off a forum member here, and have yet to do anything to it. 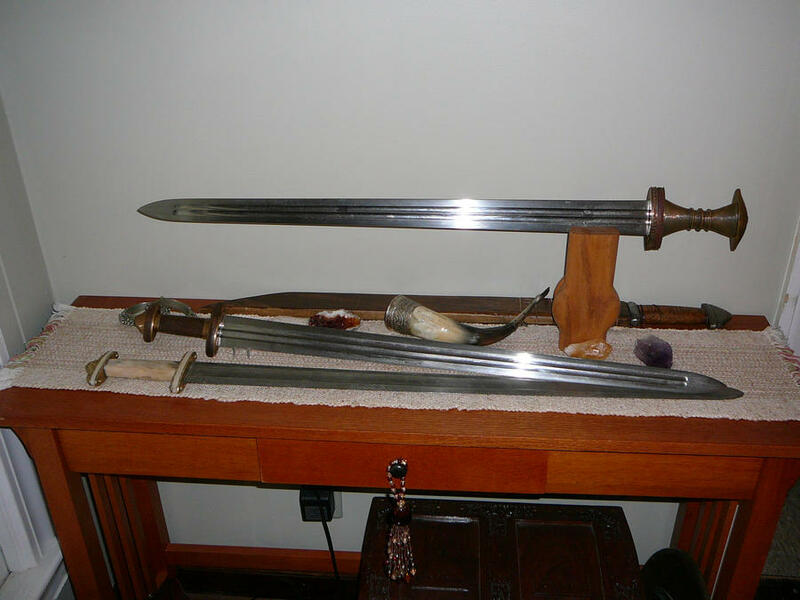 My initial hilt designs I abandoned slowly, as I could never really see them being pulled off well by myself. As of late, I have been a part of the crowd bit by the 'Migration-era Bug', and decided to check out some earlier hilt styles, as I find them beautiful and fascinating. I then began to play around with the idea of an 'Adventure Sword' (I recently started playing multiple Legend of Zelda games again) and I decided that I wanted a usable sword with a fantasy/historical merger. 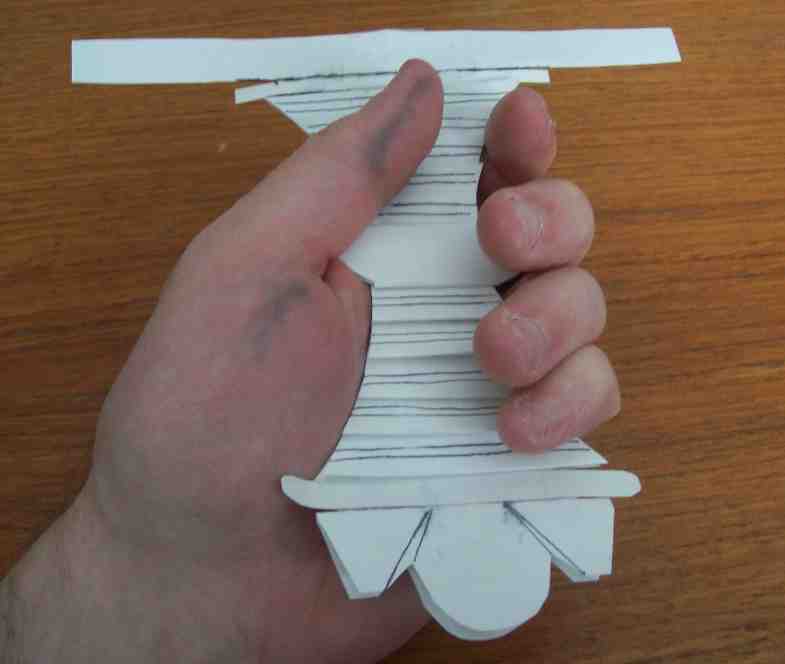 The paper mock-up is the initial design. 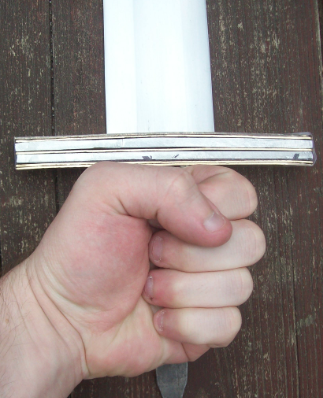 A thin (sideways) metal cross-guard with a wasp-waisted grip, and a metallic pommel, taken from a carved South african tribal knife. 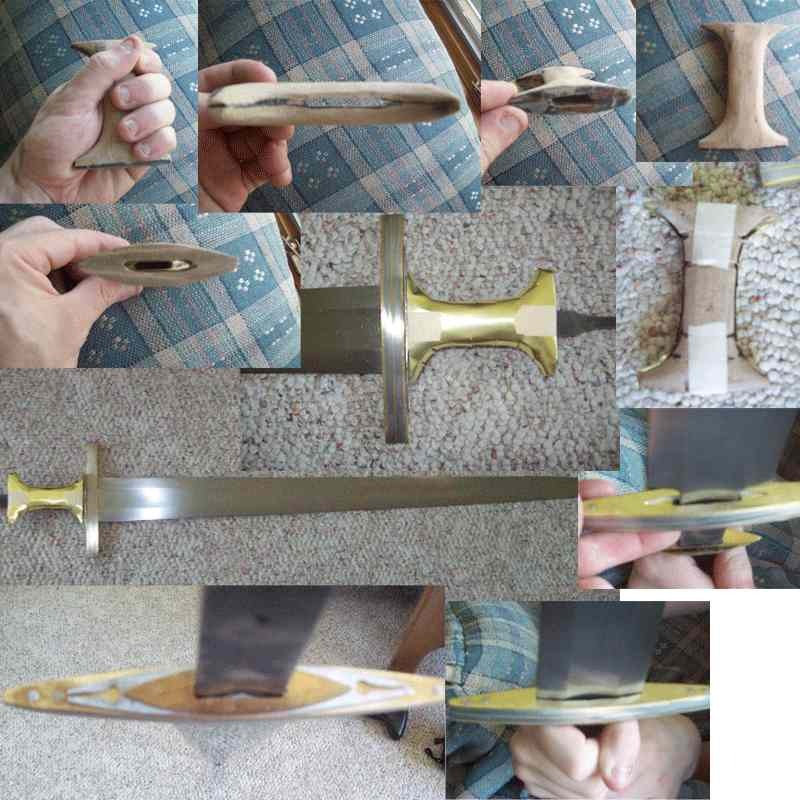 The waisted grip is clearly based off of the metallic Kragehul/Nydam sword hilts, but will be done in overlapping metal strips, with the edges providing a pleasant 'scale' grip (after they have been sanded a bit). The drawn lines represent a bulged line in the metal strips--like a hammered-in riser. I plan on adding a decent bit of mass to the hilt, as I have no issue swinging a 3lb-ish sword for a long while, but would like to have something a bit faster feeling (gotta have good recovery swings against monsters ). It doesn't look bad but I would shorten the cross a bit. Over all I like the look. I assume the crossguard will be shaped in the 3 dimensions so it goes with the rest of the hilt. So the cross guard might look cool if it had thinner tips than the middle. Giving it a lenticular look when viewed from above. I don't think it would have to be super extreme but enough to flow from the rest of the handle. I hope I'm explaining it well. But can't wait to see the final product as the initial mockup has potential. here are some more traditional photos very much like what you are doing. I would personally prefer a thinner cross, like a type 1. Additionally, a thinner central profile and more elegant waisting would look better, I think. However, the tang is literally as wide as the central waisting, and so I am somewhat stymied there, as I don't really want to remove material from the tang. As for the cross, I played around with a wider, thinner style, and a shorter, thicker baltic-esque style. I'm still not sure exactly what I want to do with it yet. I like the looks of it. Of course I'm a little biased, that is my favorite blade type/profile. Perhaps as Luka suggested a slightly smaller cross, but at the same time method of construction will enter in if the project gets past the paper stage...if you go for sandwiched material construction like a migration era weapon that will likely drive the shapes somewhat. Finally got something of an update--had to scrap first design and construction methods partway through. Then school and finals and my job got in the way, and I just had a few hours free time this week to work. New guard is setting up with glue now. I put it between two steel plates and pieces of paper in the vice, and beat the handle/twisty part closed with a hammer. It's in there tightly. Checked with a flashlight underneath the piece before and after gluing to check for light slits--none showed up. Turns out, epoxy is a fiddly beast--and sticky like you won't believe. Those ether bonds won't let go for nothin'. I've had to scrap ideas tons of times. turns out that some ideas work well when you have the correct tools to make them work. but nothing beats the feeling of making something your own. your getting to a spot that i usually hate though. punching the upper guard of pummel. i don't know what tools you have available to you but no matter what i use, i always hate that part. I've honestly though about just hot punch and drifting guards just so i wouldn't have to deal with a drill bit walking all over the place or slipping out of place. but if you have a some kind of mill, that would work best. So I'm a little stuck. I have fiddled with tape stencils, ideas, drawings, and all manner of metal types, but I cannot seem to make the sheet metal cover the grip as I want. I had piddled with using metal piping and flaring it out to the shape I desired, but I couldn't get that to work cleanly, so I went back to my carved wooden grip. I have cut crude insets for wire risers, but can't even seem to get a clean metallic covering to take shape, much less show features underneath. Any suggestions? yeah what your attempting there is a really tricky piece to work with due to its shape. those big curves, in order to get them to fit flush, you would have to resort to a lot of stretching and possibly shrinking on the metal to get a good fit clear around the grip. 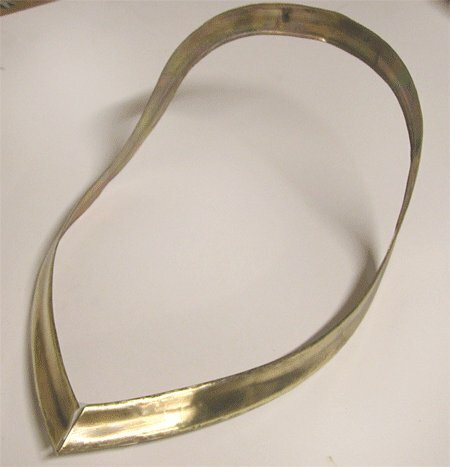 then if you'd want that to look seem less, (if your choosing brass) brazen them together, a really ugly task. now it takes a good bit of skill, and if you want to give it an attempt, try it, but don't pull your hair out - because this shaping will be pretty tough to do but I'll break it down for you the best way i would try it. -start out with the rough shape cut out, and make it very 'proud' or over sized, the metal you stretch out you can cut off later and will have to. -if your using thin sheets of brass/bronze that's shown here, using your other hammer use light hammering actions. brass will move without a lot of thwack, but cheap brass has a tenancy to crack when being worked. and the metal will begin to dome over and follow the peen of the ball peen hammer. -when you begin to work on the top and bottom where those big curvatures are, use the same process, but you may have to make a few relief cuts in the metal into the curve. this would prevent the metal from making a wrinkle or begin to fold on itself. -to get the look of the risers underneath, get a small chisel (not a wood chisel) and simply punch out the lines you want for the risers until they become the desired height and with. are you annealing the sheet? if it's thin enough to start and you anneal it, you can easily press it into shape. The sheet is 36 or 38 gauge or some such; scrapbook embossing metal. It's honestly an ugly yellow-green brass, but shaped and sanded I think it might contrast OK with the red brass I already have. How would people suggest I anneal the metal? I have access to open flames (i.e. fire pit) and could put it in the oven, but I don't really have a torch or much stronger than the above. I'd love to shape it from a block of metal, but I don't have the tools to do it efficiently or the patience to worry away a solid chunk. with metal that thin it won't take much heat to anneal it. I'm not sure how brass works I'm more familiar with steel and its annealing process. if you had a plumber's propane torch that would be quick to heat it up. but actually for how thin this metal is an oven may work best as you'll have the ability to control the temp. the metal your describing is Brass, your red brass you refer to is phosphoric bronze, this bronze is commonly refereed to as brass. the difference between brass and bronze alloys is zinc - a nasty crummy metal in my opinion. bronze = copper +tin (and other additives such as silicon, phosphorous) the term brass was interchangeable for the alloys until the industrial age. last time i bough a brass rod and heated it, it actually crumbled, did not melt, did not become non metallic, just crumbled, so hopefully someone here can illustrate how to heat brass for you a little better than myself. You'll get LOTS of work out of one of those little tanks! I'm sure somebody here has a more sophisticated technique, but I just heat the sheet to just orange or red and quickly submerge in a pan of water. Done, until it's work-hardened and needs annealing again. Worked well for that edging. It is possible to burn up thin sheet, so just heat carefully and you should be fine. its overall shape is looking good.